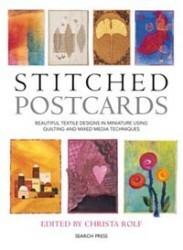 Stitched postcards are postcard-sized pieces of art, also known as artist mailing cards (AMCs), that are a new and growing trend in the world of mixed media art. This book contains an exclusive selection of some of the best designs, with contributions from a number of textile designers including the author. The lovingly created miniatures are richly decorated with a range of styles including landscapes, florals, vintage and architecture, achieved using special yarns, fabrics and embellishments. With the help of a detailed section on materials, clear explanations of the basic techniques, and the individual designers' tips, these postcards are quick and easy to make, and are ideal for using up scraps of materials and items found in nature and around the home. They can be swapped with other designers, allowing the free exchange of ideas between like-minded people from all over the world. The book includes helpful ideas on how to send the postcards through the post and how to store your collection.